We have a lot of animals on the farm, but it's always sad when we lose one. About a year and a half ago, my aunt gave us two gorgeous French Copper Marans. We named them Holly and Mistletoe. This week, Holly died. I noticed that I didn't hear Mistletoe crowing while I was in the garden, so I went to check on him. He was visiting Buddy the bunny when I checked on him and still there after I ran in to grab the phone for a picture. 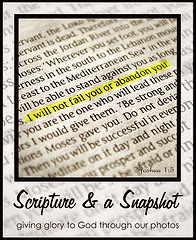 Follow Scripture & A Snapshot on Pinterest. I'm sorry for the loss of Holly ... I hope Misteltoe will be well and thrive even alone now. Yes, God sees and knows us, and He will comfort us. Sad about the loss of your chicken! I love your cute photo of Mistletoe and bunny. Sorry about the loss of Holly! 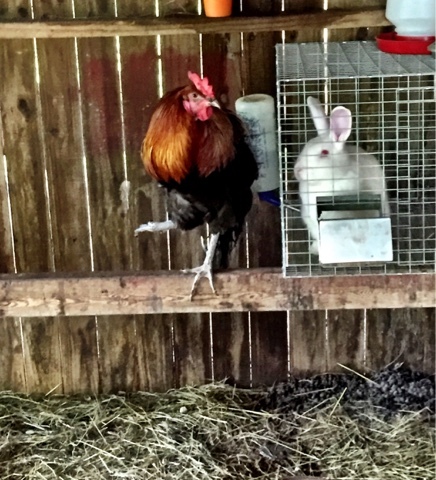 Nice that Mistletoe has the bunny to keep him company!